While Rankin-Bass gets all the love for their classic 1964 stop motion version of “Rudolph the Red Nosed Reindeer“, the above featured animated short by Max Fleischer Studios was actually the first telling of the original story as written by Robert May in 1939. May, a 34 year-old copywriter for the Chicago based department store Montgomery Ward’s, was assigned to create a property in-house that could be developed into a promotional giveaway intended to boost Ward’s 1939 Christmas sales. At first May pitched his story ideas to his five year-old daughter Barbara and within a week delivered a rough draft of a Christmas story with rhyming couplets modeled after Clement C. Moore’s “A Visit from St. Nicholas”. Initially Ward’s publicity department decided to pass on the story. The feeling was that the imagery of a “red nose” was associated with drunkeness, rendering May’s Christmas pitch inappropriate for children. It wasn’t until Denver Gillen, an illustrator in the company’s art department, produced some initial concept drawings that anyone realized how endearing a character like Rudolph could actually be. Gillen’s illustrations were so cute that the publicity department came to the conclusion that there was no way people would think of Rudolph as a drunkard and the story was approved for production. 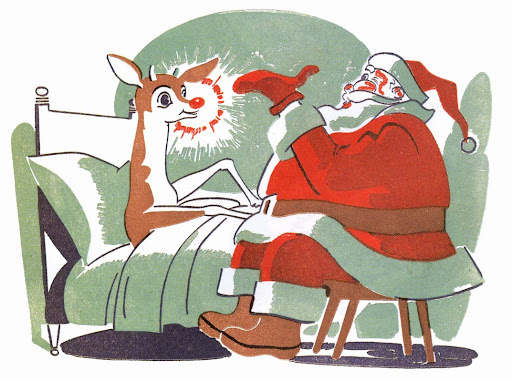 On September 1, 1939, Montgomery Ward’s retail sales department announced the Rudolph book internally to all store managers with the following: “We believe that an exclusive story like this aggressively advertised in our newspaper ads and circulars… can bring every store an incalculable mount of publicity… and, far more important, a tremendous amount of Christmas traffic”. That year 2,365,016 copies of “Rudolph the Red-Nosed Reindeer” were given away. At the time, a production run of a mere 50,000 copies could make a book a best-seller. This overwhelming success garnered the property the “largest first edition yet recorded” by the press. In 1948, Max Fleischer, acting as Head of the Animation Department for the Detroit-based industrial film company Jam Handy Productions, supervised the first animated adaptation of “Rudolph the Red Nosed Reindeer”. It is this version that is more faithful to May’s original story and Gillen’s illustrations. It’s worth noting that unlike most Rudolph products, this cartoon has fallen out of copyright, and is now available in the public domain.